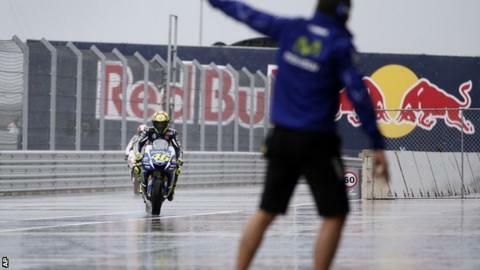 A runaway dog halted the first practice session at the US MotoGP in Texas. The session was red flagged "for safety reasons" after the animal ran in front of Suzuki rider Maverick Vinales on a wet track in Austin. Circuit of the Americas tweeted: "Slight delay as a stray dog has found its way on track. Animal Control is en route to deal with the situation." Seven-time champion Valentino Rossi won the opening race of the 2015 MotoGP campaign in Qatar. Italian Andrea Dovizioso was fastest on a Ducati, ahead of Spain's double world champion Marc Marquez on a Honda.